WTOPTV dot NET: Remember ? At first glance it appears that Eddie WROTE the song, but the fine print explains that he just "featured" it on his program. 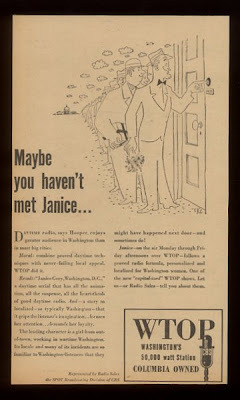 The Janice in the second ad is talking about WTOP's old soap opera....Janice Gray. If I'm not mistaken Evelyn Friman was the actress who played Janice. And speaking of OUT OF THE PAST, the show that Chuck Langdon and I do on Fairfax Cable TV. will be featuring two more of our famous graduates: ROGER MUDD and ERNIE BAUR. We should have them edited and ready to post here on the website in the next few weeks. I'm enjoying going through the videos on your site and reading about Bill Trumbull. I remember him not only as part of "Trumbull and Core," but "Two for the Road" with Ed Meyer on WMAL! I believe he now lives in North Carolina. Do you work with any other local organizations focused on DC broadcast history?